Meyerbeer was one of the most popular opera composers in his time, but in the last 20/30 years he has become one of the most neglected by opera houses and critics. Once again we see the divide between artistic directors and opera critics, on the one hand, and the paying public at the box office, on the other. The reaction of the audience at the Teatro Real after this performance should be enough to prove that opera managements and the critics are sometimes wrong. it to This was the longest final applause at of the Teatro Real’s season and this wasn’t even a stellar cast. Musical direction was entrusted to Renato Palumbo, whose performance was wholly convincing. Only slightly below the great names in opera conducting these days, Renato Palumbo is one of the main guarantors of quality anywhere just now. He has been a regular guest in Bilbao, but he is almost unknown in the rest of Spain, and this was in fact his debut at the Teatro Real, if I am not mistaken. Les Huguenots is an opera that needs a brilliant conductor, as otherwise the work can very easily drag and there are lots od people on stage to manage, including a very large choir. This reading seemed excellent to me with a great control of the forces under Maestro Palumbo’s command who drew fine playing and singing from his musicians. The edition used was substantially complete, though there were some cuts in the second part and the only point of criticism was the decision to place the singers behind the orchestra, a wrong choice acoustically. The cast of this opera is very large and some of the singers really need voices that hardly exist anymore: here there were both lights and shadows but with a very acceptable level overall. Although, surprisingly, at the final bows the opera’s principal protagonist was presented as Queen Marguerite de Valois, personally I have no doubt that the plot’s real key figure is Raoul de Nangis, sung here by the American tenor Eric Cutler. The development of singing in the last 100 years has meant that this character cannot be sung today as it was during 19th century: falsetto is not accepted now – countertenors apart - and in addition singing between mixed registers is a technique that is completely lost. This brings up the problem that singing Raoul today requires a tenor with a good middle register and an outstanding top, since he has to reach further than a high D. Eric Cutler is a light-lyric tenor, not robust enough for the character, who took refuge in pure falsetto in the first part of the opera. In the duet with Valentine he was very much better, passing this test with great courage. His location on stage didn’t help him however, so that he was almost inaudible at times. Queen Marguerite de Valois was the French soprano Annick Massis, whose performance was hardly more than acceptable. Her soprano is essentially well suited for the character – it needs a light-lyric soprano with good coloratura and very easy top notes and Annick Massis could be all this, except that her voice is fairly small and projection is not too good although she too was disadvantaged her stage position. I do not know who decided that she is the protagonist of the opera, except that perhaps she is better known than some of her colleagues in the cast. In this same theatre though last month Plácido Domingo, despite all his fame, took his bow early in Iphigenie. The Russian bass Dmitry Ulyanov was a pleasant surprise in the character of Marcel. This singer is almost unknown in Western Europe, but his singing is more than satisfactory. To have him in this role is all the more welcome because his voice is quite remarkable in volume, with a good range, and more than enough nobility for the part. Count Nevers was played by the Greek baritone Dimitris Tiliakos, whose performance did not convince me. He also suffered the consequences of being placed behind the orchestra. Count Saint-Bris was interpreted by the Italian bass Marco Spotti, whom I do not find well suited to the part. The character needs a bass-baritone and Spotti is a pure bass, which cause him problems in the high register. Apart of this, his performance was fine. Urbain is a more complicated role than it often seems and in fact I have never seen a good performance of this character on stage, regardless of who was singing it. The French mezzo soprano Karine Deshayes did been much better than anyone I have heard in my past experiences of the role however, which is a tribute in itsef. 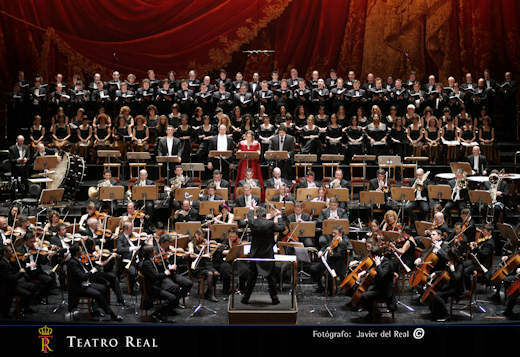 The numerous secondary characters were strongly cast without exception and the Teatro Real was about 90 - 95 % full. The audience was enthusiastic throughout and at the final bows, the best receptions were for Dmitry Ulyanov, Julianna Di Giacomo and Marco Spotti, apart from Renato Palumbo. Eric Cutler received applause mixed with some booing.